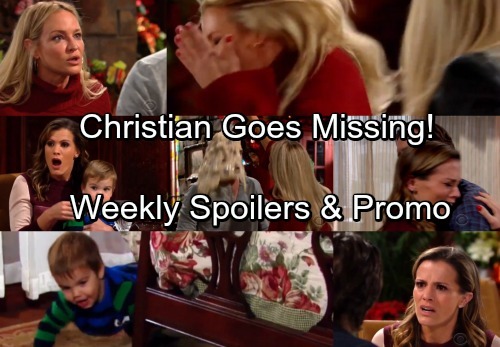 The Young and the Restless (Y&R) spoilers update for the week of January 1-5 tease that some exciting drama’s coming up. For starters, Chelsea (Melissa Claire Egan) will face total terror. She’ll head to the athletic club with Connor (Gunner and Ryder Gadbois) and Christian (Jude and Ozzy McGuigen) in an upcoming episode. Chelsea will happily watch the boys until something distracts her for just a moment. Of course, a moment is all it takes for a tot to disappear. That’s exactly what’ll happen when Christian suddenly goes missing. At first, Chelsea will think Christian just wandered off. She’ll look around and call his name, but the kid won’t be anywhere nearby. Chelsea will get the staff involved, but Christian still won’t turn up. At that point, Y&R spoilers say Chelsea will really start to panic. When Chelsea fills Nick in on his missing son, he’ll immediately rip into her. Nick will think Christian’s been abducted, so he’ll naturally be concerned. His fears will come out in the form of anger as he lets Chelsea have it. The Young and the Restless spoilers state that this crisis will truly test Nick and Chelsea’s relationship. In the meantime, Sharon (Sharon Case) will be on a mission. After getting updates on Scott’s (Daniel Hall) “other woman,” Sharon mull over what she believes. She’ll briefly doubt Nick’s claims, but acceptance will come a bit later. Sharon will realize Abby (Melissa Ordway) must be Scott’s cheating partner. The Young and the Restless spoilers say Sharon and Abby will exchange slaps over this betrayal. Abby obviously needs to watch her back from now on. No one steals Sharon’s man and gets off scot-free! Sharon will make sure Abby suffers, but Scott needs to go down as well. He’ll face Sharon’s wrath when she confronts him and pours some sort of glop over his head. On a happier note, Cane (Daniel Goddard) will finally make a bold move with Lily (Christel Khalil) this week. Y&R fans can expect a steamy lip lock, so this reunion’s moving along at last. We’ll keep you posted as other news comes in. Stay tuned to the CBS soap and don’t forget to check CDL often for the latest Young and the Restless spoilers, updates and news.